The Making of Billy Squier's "Signs Of Life"
"Signs Of Life" signifies Billy Squier's first studio venture since 1980 outside the auspices of famed German technician/producer Mack, who collaborated with Billy on both "Emotions In Motion" and "Don't Say No". As previously reported, Mack and Billy parted company subsequent to the "Emotions" project. Originally slated as Billy's new cohort was England's Mutt Lange(Def Leppard, Foreigner, AC/DC), but last December, only days prior to the initial recording dates, Lange was forced to withdraw from the project. Billy's situation became problematical: where and how to find "an extra set of ears" ("sound insurance", as Billy puts it), without causing further interminable delays to the project. The prospects of locating someone both "creatively and logistically compatible with my needs," were slim. Another controversy with the Steinman selection was the fact that all of his production work was with material he'd written. How would he respond to titles he's not fathered? Could he distinguish his skills as a producer from his seeming need to write, arrange and generally dominate the entire creative process? Some industry wags upon hearing of the Steinman-Squier teaming suggested we'd be in for more of that over-produced wall-of-sound ersatz Phil Spector recording; complicated arrangements and multi-layered over-dubs(omnipresent throughout the Tyler record and to a lesser extent on most of Steinman's work). But those same industry people forgot that Jim Steinman first came to prominence over five years ago by way of his work with Meat Loaf--a hard-driving rock outfit not known for precious blanketed arrangements or subtle, laid-back lyrics. In fact, it was his work with Meat Loaf that first brought Steinman to Billy's attention. As Billy himself recalls, "That first Meat Loaf album remains one of the most passionate and exciting records of our time." So after working with the relatively tame Tyler, Air Supply and Manilow material, Jim says he was ready to get back into the studio with a group. "I missed working with a band. I like the camaraderie and feeling you get with an actual band--as opposed to studio musicians." "With the exception of the Meat Loaf records, it's true; everything I've done up to now I've pretty much written, arranged and produced in total. Frankly, it's incredibly difficult to do it all. It's very draining, especially when you've written the material you're producing. Each song tends to become like one of your children and quite naturally you want to protect them all. Furthermore, I usually hear arrangements and production in my head a certain way at the time I write my songs...As the producer I won't venture too far away from that initial concept. I'm not at all sure how objective you can be as a producer working with material you've written. That's what I've enjoyed about working with Billy--and what I've missed since the Meat Loaf days. With Billy's material I was able to experiment with more ideas, to suggest different things here and there--things I probably wouldn't have done on my material." The role of rock album producer is thought to be rather dubious in terms of defining specific contributions. Of course it differs for various acts, but with an artist like Billy(who has developed and refined a rather unique, self-contained style and 'sound' over the years) we wondered just how Jim might characterise that role in general and his work with Billy in particular. "My ultimate objective is to get the stuff down the way Billy hears it in his mind," Steinman says with a straight-forward, matter-of-fact tone. The initial impression one gets from a conversation with Jim Steinman is that this is a man who first and foremost is a real fan--a true booster of great rock. "Working with Billy has been a challenge," Steinman explains. Since he wasn't writing the songs this time out and because the musicians knew all the "basics" before he arrived on the scene, the sessions provided an entirely new opportunity for him. "There was alot I could do--which Billy wanted--in contributing to the arrangements; with keyboards and background vocals, for instance. "My first aim was to open Billy up to things inside himself that he might have not been using, to try to make the album even richer and more romantic, more dramatic--even cinematic, theatrical. We used more studio 'techniques' than Billy had employed in the past." Ray Tusken is Vice-president in charge of A&R for Capitol Records. He recently heard the rough mixes for "Signs of Life" and has his own opinion as to the role of producer, especially Billy Squier's producer. "The idea of having somebody there in the final analysis is to have a sounding board--somebody with a different viewpoint. That can be incredibly important," says Tusken, who has had an active interest in Billy's career since the artist first signed with Capitol in 1979. In those days Tusken was Director of Album Promotion for the company and played an important role in first getting Billy's music exposed nationally on the country's major radio stations. "Jim's contribution on "Signs" was very valuable--that's apparent and you hear it right away," Tusken further observes. "But the key thing is--and it's pretty obvious to anyone who's worked with him--Billy is always in COMPLETE control. You can feel it when you're with him, that it's HIM. The "Sign of Life" project saw Billy assemble a triumvirate of unrelated, diverse and even potentially conflicting talent. At the apex of the Squier talent triangle is Billy and the "band". They're a well-heeled, close-knit team, which after three years together retain a strong concept of what they're about musically and what to expect from each other. "We've been together for so long," reflects keyboardist Alan St Jon, "we have a certain way we act around each other when we need to get things done. A certain attitude--I call it a sort of magic--I think it shows in the way we play together. The very idea of introducing a new producer and new engineer(Tony Platt) whom we've never met before appeared awkward in the beginning, to say the least. Since we are so very comfortable working together," Alan continues,"for Tony and Jim to come walking into a situation cold as they did was rather like trying to fit a yet unshaped form into a specific mould. Could it be done, and if so, what would the degree of difficulty be? That was the question. To acclimate ourselves to each others' way of doing things was quite a challenge. I don't think just anybody would have been able to stand up to it." Alan concludes, "Somehow we did it though. The choice of Jim and Tony was simply perfect. They became a real part of the family almost immediately--I know you can hear that throughout "Signs of Life." Tony Platt, Billy's new engineer was another untried part of the new Squier production team. 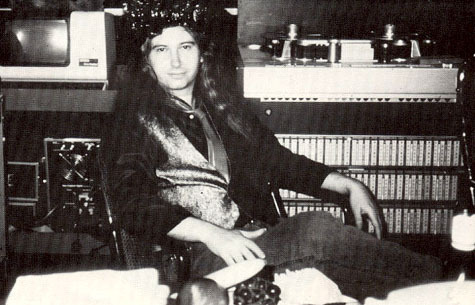 Normally the producer has a particular engineer he prefers to work with and Jim Steinman is no exception. But Platt was not Jim's regular engineer. In fact, before "Signs of Life", they'd never even met. For "Signs of Life" Billy was interested in trying out something completely new at every stage of the project. He knew Tony only by reputation (from his work with Def Leppard, Foreigner, AC/DC, the Stones, etc.) before working with him. Within the first few days in the studio, Billy was completely enamoured with Tony's skill and innovative engineering concepts..and the triumvirate was complete. Commenting on entering the Squier situation with an engineer he'd never worked with, material he'd not written and a band thoroughly rehearsed and ready to put the music to tape, Steinman humourously remembers: "It was wild. When I started I was real nervous about doing it--especially about not being able to work with my engineer. Because my engineer is like my right arm. With Tony it was like working with this right arm transplanted from England. But after working with him it became abundantly clear the depth of the man's talent; the breadth of his uncanny studio savvy. He brought a whole different set of sound values with him. "Tony hears things a certain way," Steinman outlines. "I hear things a certain way and so does Billy. So, at the beginning I surmised our combined ears were likely to result in producing something either catastrophic or else truly spectacular." 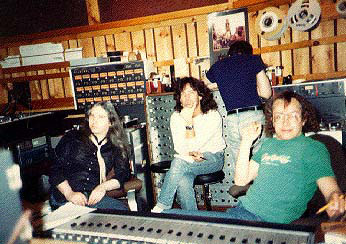 Steinman presumes another reason Billy wanted to use Tony and not Jim's regular engineer; "Beneath it all, I really think Billy didn't want to be outnumbered. He was showing alot of faith going with me. I think he was a little nervous because the stuff I've done in the past has had such a personal stamp on it. I think he was a little worried that together with my own engineer we might be somewhat regimented. In the back of his mind, perhaps he felt that the combination might produce a record sounding too much like one of 'my records' and not enough like one of his. "Someone recently asked me:'Are you putting your personal stamp on this? '", says Steinman, who will soon join Billy in London for the final mix of the album(having completed recording in New York). "I told him--and I think it's important everybody knows this--whatever 'stamps' you might hear on this record are all Billy's. I'm just licking them before they go on the envelope." It's a metaphorical maze for Steinman, but somehow he's able to easily telegraph the listener to the right thought by way of his rather free-wheeling imagery. "Billy once told me he really like the adventurousness of changing elements in a given situation," recalls Steinman. "He knew he wanted me as a producer, but rather than bring along a whole pre-assembled team, he decided to put a completely new one together to create a new source of energy and input. He wanted a unique 'team' of individuals working for a common cause." Steinman would appear to be as good a psychoanalyst as he is a producer. Ray Tusken perceived "Signs of Life" to be a growth album for Billy. Knight Line wondered how as record producer, Jim Steinman contrasts this to Billy's earlier work: "I think mostly it's the material Billy's written here--it's much richer. It's the difference between black and white and hallucinatory colour. This album is incredibly colourful." Jim has a proclivity for expressing himself in rather visual terms. "To me this album is like wandering into some kind of magic forest. When you hear it all together its like you enter this sort of dark enchanted place, it's passion and romance..and very nocturnal. "The first thing I told Billy when I heard the songs," he interjects with teenage enthusiasm, "is they remind me of a real nighttime album. Images replete with moonlight and roses, and yet there's always this tough side...the combination is real cool. "The lyrics are tremendous. I think Billy is prouder of these lyrics than those on any of his other work--and that feeling is justified. This time out Billy has become extremely adventurous and frankly he's taking alot of chances. Most of the lyrics have a real urban, kind of gritty, tough quality about them, a barbed-wire quality if you will. I mentioned to Billy at one point I was thinking of writing a song about the album called "Moonlight, Barbed Wire and Roses," those are the three images I see. I wish the cover of the album could be a barbed-wire fence with moonlight shining down on it and one dark red rose impaled on the fence." Knight Line observed these to be conflicting images. "That's what the whole album is about," postulates Steinman. "There's rough/tough rock and roll here and there's some gorgeous mid-tempo songs--and one ballad that's really an eye-opener. I think Billy's still amazed that he wrote it." Knight Line was anxious to extract from Billy his motivation or inspiration behind the making of "Signs of Life". On a recent phone hook-up to the London studio where he's mixing the album we attempted to draw him out on the subject. "I don't mind if other people talk about it, "Billy confides, "I just don't want to talk about it myself." In an apparent effort to avoid pigeon-holing himself, he explains: "It seems redundant to verbalise what goes into the creation of the music. It's a part of my life--I spend all my time working on it. I wouldn't attempt to speak for the music--it's there to speak for ME." Nevertheless, the ever-probing purveyors of pop propaganda continually seek him out. Rock critics, radio personalities and fans alike want the ever-elusive, so-called 'meaning behind the lyric'. "When I do the odd interview and someone asks me to discuss the songs," Billy says with candor, "that interview is over." Then in a tone bordering on finality, Billy reaches down deep for a definition of his musical principles. "I'm not here to review myself..the songs are written from my point of view. It would be silly for me to turn around and explain them. Go talk to Steinman. He might be more revealing." With Jim Steinman there is little question of boredom on the subject of Billy Squier and "Signs of Life." So he generously granted us over three hours, during which he enunciated the album's tone and timbre; the ins-and-outs were put into perspective with decided detail and detachment on his part. Following are selected excerpts from our April conversation with the ebullient Steinman(whose time and effort Knight Line gratefully acknowledges...), whose work vis-a-vis "Signs of Life" is set to become the most programmed music of the summer. "This album is really a departure for Billy. The past two records had a very specific direction and sound and didn't waver. "Signs of Life" builds upon the foundation of those albums. It reminds me of that point in Led Zeppelin's career when they did "Stairway To Heaven". When a Zeppelin fan heard it, while they could tell it was Zeppelin, they also recognised so many new elements of colour and style. On this album I think Billy has made a analogous quantum leap musically. I think there is the equivalent of four "Stairway to Heaven" tracks here. There are moments on "Signs of Life" which are fabulously visionary while physically exciting. The lyrics are emotionally open and he's able to deliver them in a way people would only speak to a lover. The album is amazingly intimate and honest--completely revealing. "All the basic tracks were cut real fast this time. They were done in about six or seven days. I recall during the sessions Billy saying "God, these songs are LONG", but they're not really--all around 4-5 minutes. Since I've written songs 10 minutes plus, they seemed almost like jingles to me. "There's alot of danceable stuff on "Signs of Life", yet it's not what you'd call a dance record by any means. However, you will find alot of dance elements there. I pushed it that way because I thought that would make it more exciting. It's not light dance music, it's more the kind the natives might do around a fire while they're cooking the missionary. A real pulsing kind of dance music--very hypnotic. "Some of the songs are tremendously dark, emotionally revealing; you get the feeling Billy really had to get alot of the things he's saying here out. The band came in with everything very well rehearsed, so what you hear in the end is about 60 percent predetermined. The rest, however, was completely spontaneous. Over the weeks of recording, Billy and I would go home and make copius notes, listing the things we wanted to do and/or try. We'd try all those things, and maybe another dozen or so right on the spot...just for good measure. "Signs of Life" is one of the best pure rock and roll records I've heard in years. It's not finished at this point, but that's how I relate to it. With what's out there, there's no comparison with songs like on the Van Halen record, for instance. I love Van Halen, but these songs go way beyond that--it would be laughable to compare it with a record like the Scorpions'. I put this record right up there with Def Leppard, except this one has much more depth to it. I'm a huge Def Leppard fan too, and I think their record is great. It's just that this record has all the fun, plus it has the velocity and thrills...and passion. "The atmosphere in the studio was literally a party. With other stuff--where I've written everything--the atmosphere can be incredibly intense because I'm doing all the parts. I don't have a second to think. With this project, there was a sensational flowing interplay between the people. I think the highlights outside the musical elements were the three times when for some reason we ordered out for barbeque. On those occasions we had some of the funniest conversations. Billy kept saying he'd wished he's taped it because they frequently got to a level of lunacy that was hard to believe. "Since Billy and I are basically co-producing, there were things that I didn't need to be around for. I could take what I call an "ear break"--I figured "well this is in fine hands, I'm gonna go rest my ears", and I'd go outside. You REALLY know a project's working well when even if you're not literally in the room, you're still there in a sense. Like a force. It's the same when Billy's not there and I'm listening to something. He's there and I can feel his presence; I can sort of imagine what he would be thinking as he listened. He says the same thing about me. That's ultimately what chemistry is all about: When people are really working TOGETHER. This has been one of the smoothest projects I've ever worked on. "I think this album will hit people like a hurricane. There are three or four anthems in there. I always imagine a kid listening in a room to the songs when I'm working on them, and if I were that kid I'd be devastated by this record. It's such a passionate, strongly felt record. I think their first impression will be that it's a real powerhouse. It's an aggressive strong, uncompromising record. I think "Signs of Life" redefines what rock and roll can be in this particular decade in that it's a very sophisticated mix of all the new elements in pop music. The way it synthesises everything is what I feel is most impressive. "Signs of Life" is an example of how real rock and roll can absorb the various elements of pop and dance music, techno-pop, etc., and mould it all together to come up with something that's totally original and yet still immediately recognisable as pure rock and roll. I think the best music of the genre has always mixed everything together, from the early Beatles, Stones, the Who..right down the line. What they'll really be hearing is 'state of the art' rock and roll. "Billy's band is the most cohesive and best rehearsed group I've ever worked with in the studio. I've always liked the band but now that I've worked with them I'm doubly impressed. Bobby(Chouinard), Alan, Doug(Lubahn), and Jeff(Golub) are all real nice guys too--great players willing to try anything. The great thing is none of the people involved in the project act like they're 'stars'. They behave as though they really have to prove something each time out, on each song. It's been a real communal effort. Alot of imput. Billy's good about that. He really seeks out other people's ideas. "Billy seems very trusting, and I'm very trusting of him. We both feel very at ease with each other. Neither of us is very protective in the sense that 'this is my turf, these are my ideas, and I want to protect them'. If he says, "That's the stupidest idea I've ever heard! ", I don't consider it an insult; that would never occur to me. Billy is brilliant in the sense of dealing with people. He knows how to bring the best things out. It was a very tricky situation, because I'm used to having total control and telling people what to do. I don't think Billy is used to working with someone like that. I'm not dominating but I have a very strong set of ideas about things...so the stage was set for a potenial 'clash of the titans'. But it wasn't like that at all. I don't take alot of the stuff that I do all that seriously; as I say, if Billy thinks an idea is stupid, that's fine. We just joke about it. If he reacts negatively to something I really believe in, I just nag him about it. During the entire experience of working with him, I think he showed a real openess about everything. Billy has a tremendous sense of integrity."